Taste test: The most striking thing about these chips is the bag that they come in: It's designed to look very, very much like a bag of Nacho Cheesier Doritos in almost every way. It's more than a little surprising that the makers of Doritos have allowed this without running to court. 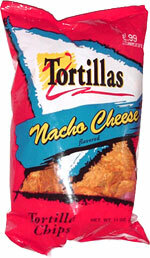 Having said that, these are good tortilla chips. They're not quite as cheesy as Doritos, but they are thick, have a good crunch and taste good. Smell test: Nacho cheese smell, good. From the package: Ingredients include Dried Romano, Cheddar and Parmesan Cheeses, Monosodium Glutamate, Dosodium Inosinate, Disodium Guanylate, and Disodium Phosphate.